SpecChem worked with the joint venture of Sundt/Rumco at the White Tanks Flood Control Project – Phase II in Buckeye, Arizona to provide a compatible system of products to meet the demanding specifications. Bio Strip WB offered an architectural finish in a 100% biodegradable, 0 VOC form release agent that was compatible with the decorative, elastomeric form liners. SpecPatch 30 is a one component, architectural light gray patching mortar for filling the tie holes and match the surrounding concrete. Final Finish is a polymer-modified, light gray, concrete resurfacer to provide an ultra-fine smooth finish to all reveals and chamfer edges. 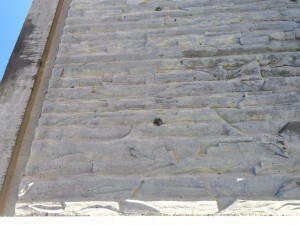 SpecRez is a water-based dissipating resin curing compound to properly cure all exposed concrete surfaces. SpecChem provides the most comprehensive concrete chemical systems in the industry. For more information call your local SpecChem sales professional.